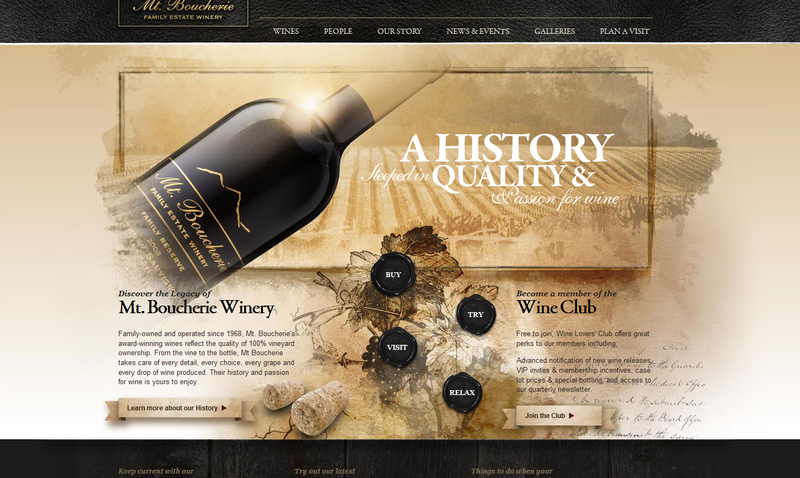 What Makes a Great Winery web site design? Here in the Okanagan, there is no shortage of great wine and great web design – however the two rarely seem to come together. At Spincaster, we have been given the opportunity to work with some excellent local wineries to improve their online presence, and there are a few consistent elements that are required to make each site a success. The first and most important element of a successful winery website is fantastic photography. Having great bottle and location shots can instantly make or break the design, and lets the user know whether or not the winery thinks their Brand and its message are important or not. Showing off your product and process allows you to visually connect with the user, promoting whatever emotion and information you want. Here are two example we like of photos as key design elements. That brings us to the next element, being the wineries’ brand. No two wineries have exactly the same values, product highlights, story, etc. In order to make your brand stand out, it is extremely important to display this on your site, whether it be a simple, minimalistic site or one focused on history and your culture. Promoting your wineries brand online should be consistent with your labels, packaging, advertising, physical location, and other branding materials. Once you have provided this information, it is important to make sure that the user knows exactly what to do next. Direct links like the Buy button in the above example are useful tools to get user to start buying online. Spincaster is currently developing a wine order tool in which wineries can easily display and sell their wines online, available later this year. If you have a favorite winery site let us know? We love to hear your opinions and why you like the websites?